Yesterday’s rain was long gone by the late afternoon and I took full advantage to get Holly out for a walk. There were a few puddles, but the skies were blue and there was even a nice breeze that put a real spring in Holly’s step. 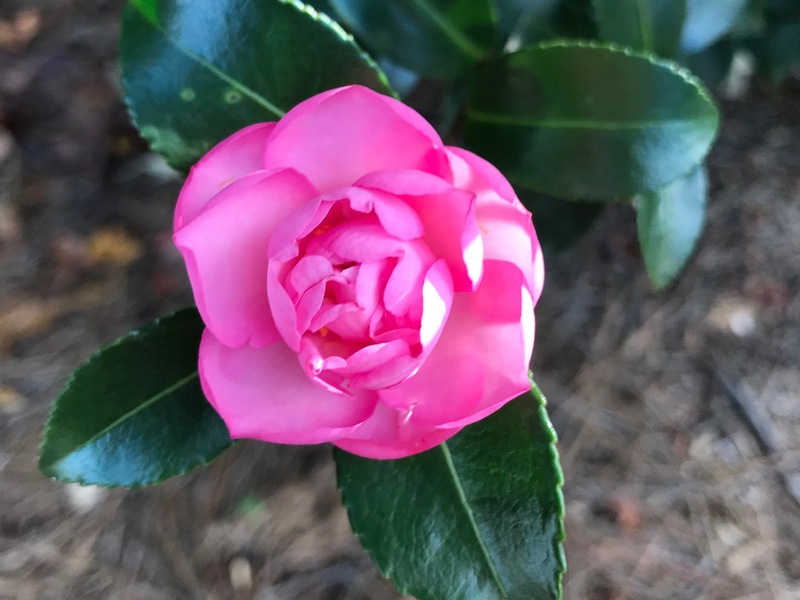 After all the rain, I was delighted to find an intact camellia blossom. The leaves were singing a song and I looked up to see (and maybe to take a video with my phone) … then slipped off the sidewalk and rolled my ankle. Ugh. I’ve spent the last 24 hours on Rest-Ice-Elevation and I think it’s going to be OK. 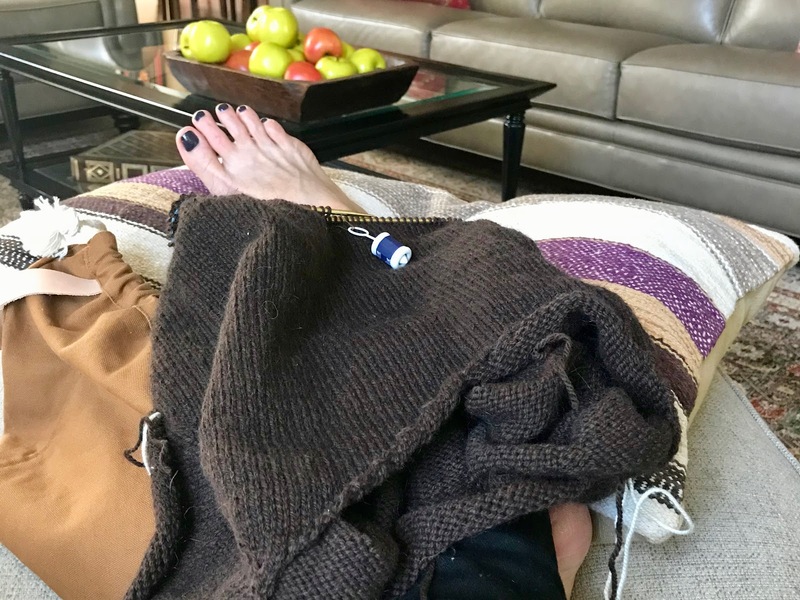 Thank goodness for knitting and audiobooks (more on both of those tomorrow) … and a sweet dog who is more than happy to sit quietly by my side. the ankle behind the knitting is a little swollen and bruised, but definitely on the mend! *I told Katie and Charlie last night that it was a “stupid” story; they told me they don’t use that word. When I asked what word they might suggest to take its place, they said “silly”. I think I understand where they’re coming from; I’m not sure my dictionary does. Stupid – having or showing a great lack of intelligence or common sense. Silly – having or showing a lack of common sense or judgment; absurd and foolish. I went to New York yesterday. I don't think it's stupid or silly…just an accident. I hope you are on the mend! Oh dear. I'm sorry that happened and I hope you're back on BOTH feet very soon! In the meantime, enjoy this forced rest with knitting and audiobooks and podcasts. Mary! I'm very sorry that happened to you! But completely an accident. (Because you are active and doing things!!!) Please take some Advil too! Ouch! So sorry! I remember when our son was Charlie's age we would not use the word stupid…and when neighbors did, Colin informed them that it was not a nice word to use. I had a conversation with a seven year old who told me kids were using the S words. I was taken aback until I found out that the S word is stupid. Live and learn. Whenever I'm laid up with a (silly . . . stupid . . . insert word here) injury, I'm always extra happy for knitting and reading. I cringed just reading about your injury, Mary – sounds very painful! Sure hope you heal quickly, and until then it sounds like you have some good things to help you pass the time. I am sooo sorry you are injured, but I am glad you have such good company as you recuperate! And, I am not sure this is either silly or stupid but rather inopportune! Sending you much love! praying your ankle gets better! I have done that too many times and it's the same ankle…eep. take care and go snuggle little miss H.
Oooh! No fun! No silly! No "toopid" either. Hope you're on the "quick mend "cycle, not in any pain and that you get a lot accomplished. Glad Holly's there to assist. Take care and wish I could be there to be your feet. Been there, done that. I'm glad yours is doing better though – I do not recommend a broken ankle! Oh goodness, hope it's better now!